Since my neck of the woods has limited eateries, I am always searching for something new and or different. We ate at Carter’s Family Restaurant a few times in the last three years we lived in the area. It had been in business for many years, but not a place I would recommend to anyone. You walked in, placed your order and then took a table. You had to stand there and read the menu. It wasn’t the best arrangement. I can’t even remember what I ate there it was so unmemorable. My husband always wanted to try a pizza but he was afraid he wouldn’t like it. While searching online for something else in Ten Mile the other day I came across a review for Carters, but the person talked about new owners and better food. So I scrolled down further and discovered they not only changed the name, they changed the entire menu. I couldn’t find a website, but I did find their Facebook page which had glorious photos of delicious looking food including chicken, ribs, a salad bar, a buffet bar and a huge pineapple upside cake. That did it, I told my husband, “We’re going there tomorrow” and go there we did. It’s not on the lake and you really can’t see the lake from the restaurant. But it is a house and it’s near the lake so I’ll let the name slide. The new owners have not done much to change the look of the place. First off let me say the restaurant is dark. We were there on a sunny day and it was dark inside. The worst is where they located the hot buffet. It is so dark in that corner that you can’t tell what’s what unless the items are labeled. The salad bar next to it is in front of a window which helps. 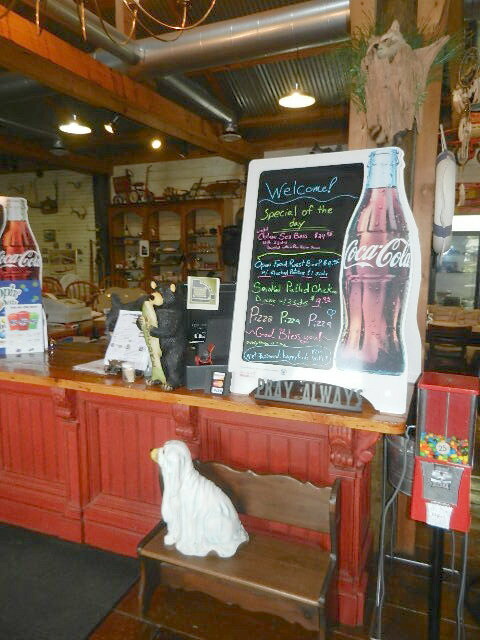 This is truly a family owned and operated business….The mom, dad and kids all work there. We had conversations with the mom and the daughter and they were very friendly. 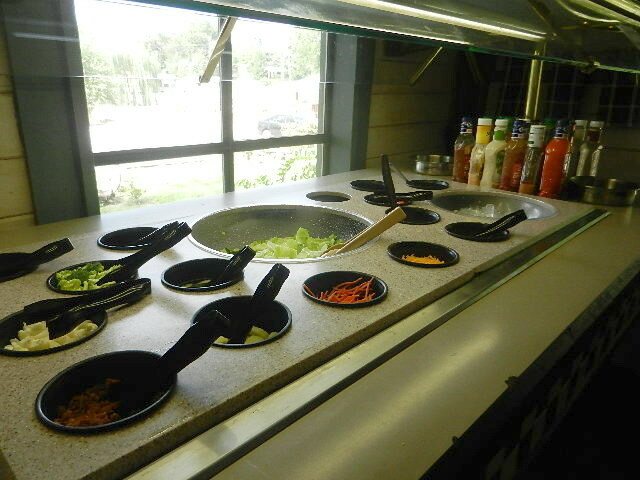 I started off with the salad bar in place of the dinner salad which is one their ‘sides’. The lettuce and other items were all fresh and crisp. They must have had more than a dozen bottles of salad dressings to choose from. I asked if I could get the catfish grilled instead of fried and was told I could and I was even given the choice of what seasonings I wanted on it. The baked potato was $2 extra but I went for it since their mashed potatoes are not really home made. They offer cornbread or dinner roll…..I took the dinner roll but it wasn’t the best dinner roll I’ve ever had. My husband is part Italian and normally makes his own pizza from scratch, including sauce. He is particular about his sauce. They gave him a little taste of the sauce and it was good enough for him to order a medium size pizza with sausage. He enjoyed it and said he would get it again. The problem lies with their location. The lake and the business around it are busy in summer, but in winter places are basically empty. 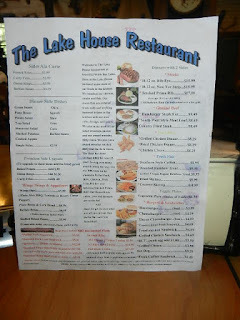 The Lake House Restaurant has already gone from their ‘summer hours’ to ‘winter hours’ meaning they are only open Friday-Sunday 11:00 am to 8:00 pm….but we were told they will probably close at 4:00 pm on Sundays soon. That means the restaurant will only be open less than three days a week. I am not sure if they will make it through the winter or not. For their sake I hope they do. If they can keep that short schedule and then open more days during the week in summer they could do alright. Will we go back? Yes, its close, the service was good, the food was good and the prices are good. Since there is no website you can check them out on Facebook. UPDATE: We did go back a week later. I had a grilled chicken sandwich and my husband had the hamburger steak. We were both pleased with the meals. Yes, we will continue to go back and try different things.